German rabbi; born about 1739; died at Fürth Dec. 17, 1819. After having spent a few years in the yeshibot of Posen and Zülz, Cohn went to the yeshibah of Jonathan Eybeschütz in Altona, from whom he received his rabbinical diploma. His first rabbinate was in Rawitsch, where he opened a small Talmudical college. He was then rabbi successively in Krotoschin, Zülz, Kempten, and Fürth, following at the last-named place R. Hirsch Janow on the death of the latter in 1785. 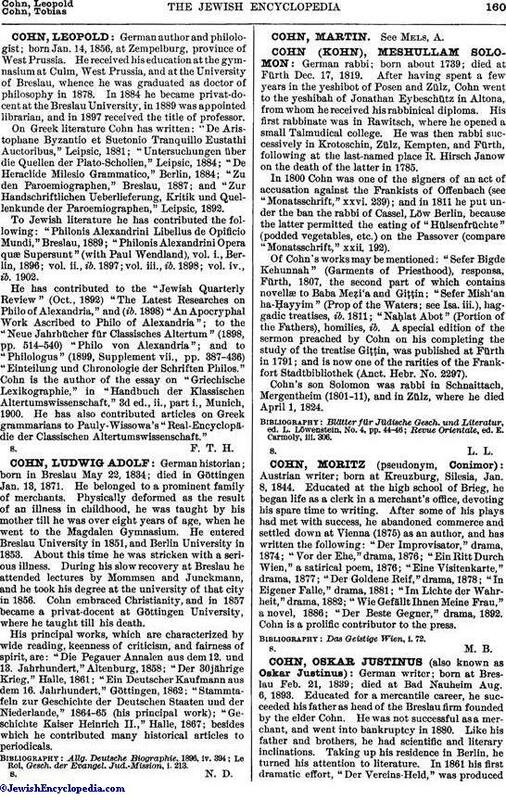 In 1800 Cohn was one of the signers of an act of accusation against the Frankists of Offenbach (see "Monatsschrift," xxvi. 239); and in 1811 he put under the ban the rabbi of Cassel, Löw Berlin, because the latter permitted the eating of "Hülsenfrüchte" (podded vegetables, etc.) on the Passover (compare "Monatsschrift," xxii. 192). Of Cohn's works may be mentioned: "Sefer Bigde Kehunnah" (Garments of Priesthood), responsa, Fürth, 1807, the second part of which contains novellæ to Baba Meẓi'a and Giṭṭin; "Sefer Mish'an ha-Ḥayyim" (Prop of the Waters; see Isa. iii. ), haggadic treatises, ib. 1811; "Naḥlat Abot" (Portion of the Fathers), homilies, ib. A special edition of the sermon preached by Cohn on his completing the study of the treatise Giṭṭin, was published at Fürth in 1791; and is now one of the rarities of the Frankfort Stadtbibliothek (Anct. Hebr. No. 2297). Cohn's son Solomon was rabbi in Schnaittach, Mergentheim (1801-11), and in Zülz, where he died April 1, 1824. Revue Orientale, ed. E. Carmoly, iii. 306.